There is a water theme throughout Bubble Man's stage. Portions of the stage actually take place underwater. 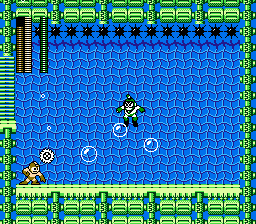 When jumping underwater, Mega Man can jump all the way up to the top of the screen, which is a bad idea considering the spikes that line the ceiling. You will find the Metal Blade weapon quite useful in this stage. The ability to throw it in eight different directions will allow you to eliminate threats that appear all around the screen. A: The first threat you encounter comes in the form of the frog robots known as Kerogs. They remain motionless on their platforms, but they release three tiny Kerogs from their mouth. The tiny Kerogs bounce around periodically. Use the Metal Blade to rip through them to eliminate them, and then shoot the large Kerogs to clear a path to the next platform. After defeating three Kerogs, you must cross a series of short platforms which fall shortly after you land on them. Keep pressing right, and jump as soon as you land in order to keep from falling to your death. B: After falling to the section below, you'll encounter snail robots known as Tanishi. There are three of them and they patrol their platforms back and forth. If you shoot them once, it will knock their protective shell off, and they will travel even faster. Once again, the Metal Blade will come in handy if you decide to engage them. Whether you do or don't, falling through the bottom of the screen is your goal. After you fall through one screen, you will drop underwater, and face another screen with three Tanishi. Make your way to the bottom. C: Now that you are underwater, you must be careful not to jump so high that you hit the spikes which line the ceiling. After walking along the bottom, you will encounter a giant robot fish known as an Anko. They remain motionless, but they shrimp robots known as Shrinks, who can appear three at a time. The Metal Blade will easily rip through the Shrinks, but to remove the Anko, you must hit its only weak spot; the small lamp that dangles in front of their eyes. D: After you remove the Anko, you must proceed to the right, dodging the M-445 robots that descend from the ceiling, and jumping carefully over the platforms beneath the spikes. Try to jump just high enough to reach the next platform and no higher. When you reach the end of this section, you must carefully drop down between two walls of spikes before proceeding to the right. E: You must defeat another Anko, followed by two more Kerogs. Use the Metal Blade to clear away the crowd of enemies. You can even stand on the ground and fire Metal Blades at a 45 degree angle at the Anko's lamp. You may wish to wait, however, and see if you can earn Extra Lives from any of the Shrinks that you destroy. Continue to pay close attention to the height of your jumps as you attempt to climb over the platforms behind the Anko. F: In the final stretch, you must carefully leap from one platform to the next, while watching out for falling crab robots called Claws. They tend to alternate between falling in front of you and falling behind you, so wait for a Claw to begin falling behind you before attempting to jump to the next platform ahead of you. Bubble Man's lair is completely filled with water, so the same underwater jumping physics applies in here, along with the danger of jumping all the way up to the spikes along the ceiling. Bubble Man himself is not too fast, but he's very maneuverable underwater. He has two weapons: his Bubble Lead weapon, and a standard energy gun which he fires when he's low enough to the ground to hit you with it. He likes to swim high up to the top of the room and fire his Bubble weapon down upon Mega Man. Once he lands, he'll swim back to the top of the room and repeat the process. His defeat awards Mega Man with the Bubble Lead, which rolls along the ground until it hits an enemy or an obstacle. The weapon which Bubble Man is weakest against is the weapon that probably helped you throughout the stage: Metal Blade. Not only does Bubble Man take more damage from the Metal Blade than anything else, the ability to fire it in multiple directions is very helpful. You can allow Bubble Man to float up to the top of the screen, and stand beneath him while firing the Metal Blades straight up at him while he slowly sinks to the bottom. This reduces your need to jump, and thus reduces the threat of the spikes at the top of the screen. This page was last edited on 15 December 2015, at 16:25. This page has been accessed 20,754 times.